Is she a medium? A psychic? Alexa Bentley only knows one thing for certain; she can talk to ghosts. And sometimes, they take her advice. Missing in Michigan is ideal for fans of the Sookie Stackhouse Southern Mysteries, quirky female characters, and the Paranormal Mystery/Supernatural Suspense genre. This exciting, funny new series will keep you guessing! Alexa’s unusual ghost therapy skills take her to a remote corner of Michigan’s Upper Peninsula. But this case is much trickier than anything else she’s ever encountered. A grieving ghost, several missing teens, and a supernatural creature from Native American folklore stand in her path. Along the way, she manages a bit of romance and lots of witty humor. Alexa Bentley Paranormal Mysteries – She’s a witty, mystery-solving ghost therapist. From the author of the Midnight Myths and Fairy Tales Series. 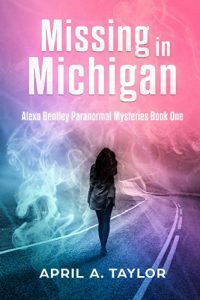 In Missing in Michigan, the first book in this brand new series, Alexa Bentley isn’t quite sure if she’s psychic, a medium, or something else alltogether, but one thing’s for sure: she can talk to ghost. As a therapist for the deceased, she helps troubled spirits move on to the afterlife, but that’s not always as easy as it sounds. Missing teens, a supernatural creature from Native American folklore, and of course a plethora of ghostly activity are only the tip of the ice berg. I don’t want to give away any spoilers for the plot, so I’ll just say that a lot of stuff happens, and some of it you wouldn’t expect in the slightest! The story is fast-paced, the plot entertaining, the characters – in particular Alexa – are intriguing, and overall, this is a gripping read that fans of paranormal mysteries will certainly enjoy.